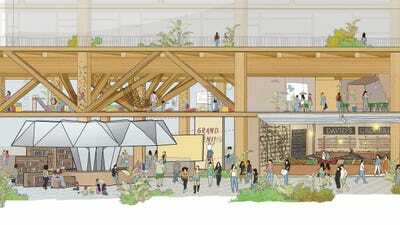 Footpath Labs – the urban innovation subsidiary of Google’s parent company, Alphabet – is thinking about using an unprecedented amount of tall timber technology, in which layers of timber are glued together in panels, to build a high-tech neighbourhood on Toronto’s waterfront. 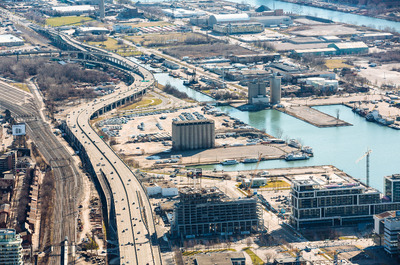 Waterfront Toronto, a local group that administers revitalization projects, is working with Footpath Labs to design the new neighbourhood, called Quayside. 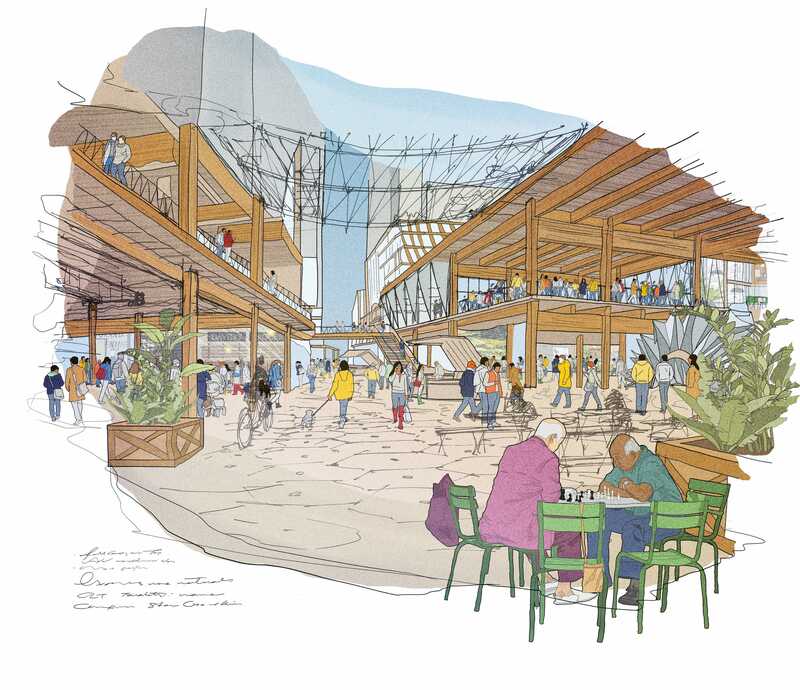 The 12-acre development – expected to cost at least $US1 billion, according to The Wall Street Journal – will feature heated roadways and other innovations. If the neighbourhood is built as planned, it could be the largest tall timber development in the world, according to Bloomberg. The new development has generated some criticism. 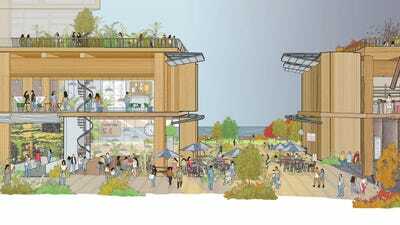 Business Insider previously reported that residents felt Quayside could become a “new Silicon Valley,” leading to gentrification, income inequality, and higher housing prices. After remaining quiet for several months about its exact plans for the Toronto waterfront, Footpath Labs shared a series of ideas for the development in a Tuesday announcement. Take a look. Toronto, like many other cities, is struggling to maintain its socioeconomic diversity due to a rise in housing costs and congestion. Climate change is also contributing to the city’s challenges. Footpath TorontoAn aerial view of the site for Quayside. 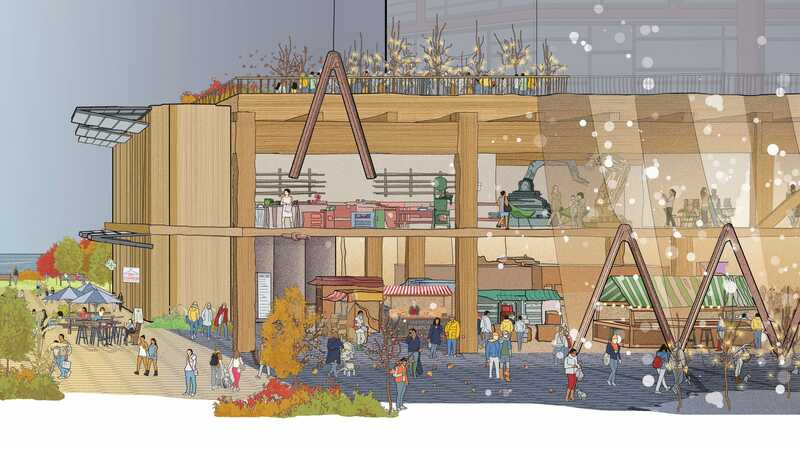 Quayside, which used to be an industrial space and dockland, is Footpath Labs’ planned pilot location for testing what could be implemented on a larger scale. 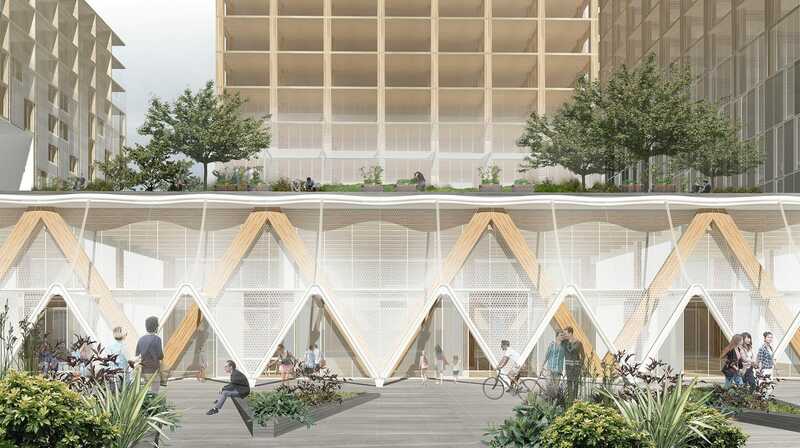 The proposed modular housing, for example, could be used as a model for more neighbourhoods that offer low-cost, quickly built residential spaces, according to Footpath Labs. The planned self-driving shuttles could form a transit system that doesn’t rely on private cars, and the neighbourhood’s renewable energy system could act as a blueprint for other locations. Footpath Labs has committed about $US50 million to the project’s first phase, though the company is still waiting on a final approval. Waterfront Toronto intends to build infrastructure that can help protect Quayside from flooding, and it received a $US996 million investment from the local and national governments to support the project. The neighbourhood, which is one of the largest areas of underdeveloped urban land in North America, covers about 3 million square feet. Zoning laws allow 90% of Quayside to be residential space – about 3,000 units – but Footpath Labs has not specified how many units it plans to build. A sustainable building model is the first step toward creating an affordable neighbourhood, according to Footpath Labs. 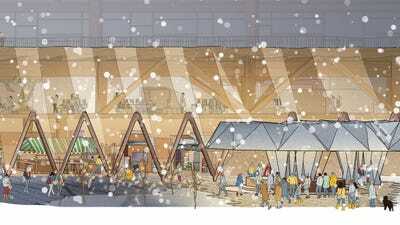 The Alphabet subsidiary plans on using Canadian timber to achieve this. 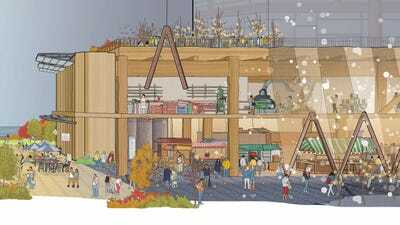 Footpath Labs is interested in building all or most of Quayside’s buildings using tall timber. Proponents of tall timber technology say the material is a viable replacement for steel and concrete because it is strong and fire-resistant. According to Footpath Labs, tall timber supports Canada’s timber industry, provides warmth to residential spaces, accelerates construction times, and saves money in the long run. In addition to affordability, Footpath Labs is focusing on making Quayside buildings adaptable and sustainable. The neighbourhood design features units that can accommodate a range of household incomes. Quayside’s buildings have also been designed to include centralised parking throughout the neighbourhood. 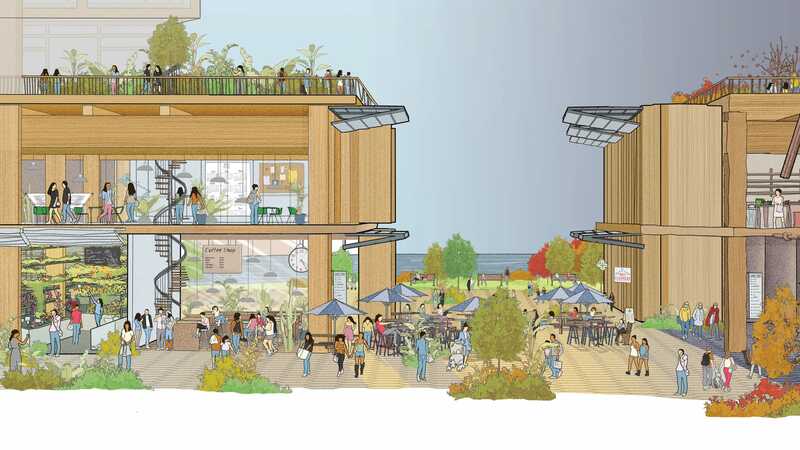 The buildings will feature green roofs to improve sustainability. On the whole, Footpath Labs wants its buildings to be modular, and it believes this can be done at the same cost – or even less – as conventional buildings. 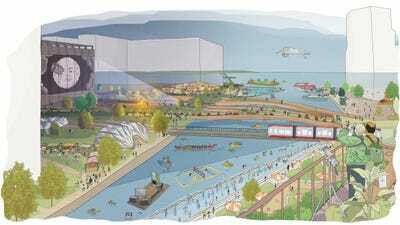 The Quayside proposal envisions a “bold” system of public spaces and connected waterfront parks. Footpath Labs wants Toronto residents to double the number of hours they spend outdoors. Footpath Labs is looking for innovative ways to improve transportation — both for pedestrians and vehicles. 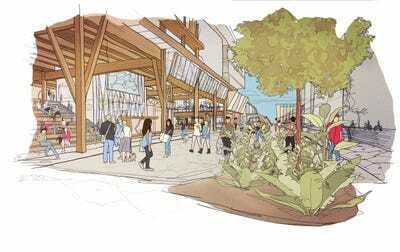 Quayside’s streets will feature wide footpaths, bike lanes, and a main road for cars and other transit. The neighbourhood’s “public realm” – its parks, plazas, shops, and footpaths – is designed to be comfortable all year long. Quayside’s pavement will be made of conductive concrete that can melt snow and ice. It will feature precast slabs that can be maintained and replaced quickly, and LED lights will be used to signal changes in road use. Pavements will also include tree-filled zones that help absorb stormwater. Dan Doctoroff, Footpath Labs’ CEO, believes the Quayside project can improve residents’ quality of life by creating more jobs and lowering carbon emissions. The waterfront project has been scrutinised by privacy experts, who have raised concerns about the company’s plan to collect data via sensors that monitor energy usage, noise, traffic, and pollution. Experts say there is a need for safeguards that allow people to opt out of having their data be commodified. Footpath Labs says it wants to use data on how Quayside works to help make the neighbourhood function better. A board member of Waterfront Toronto resigned instead of signing the most recent deal, citing “numerous unanswered questions” about digital privacy and governance as part of her decision. 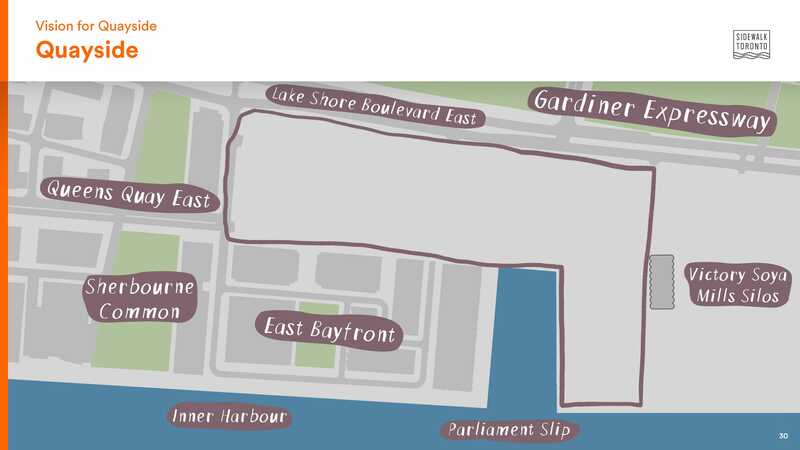 According to the current deal, Footpath Labs and Waterfront Toronto will come up with a final plan in 2019, though they can still opt out of it.